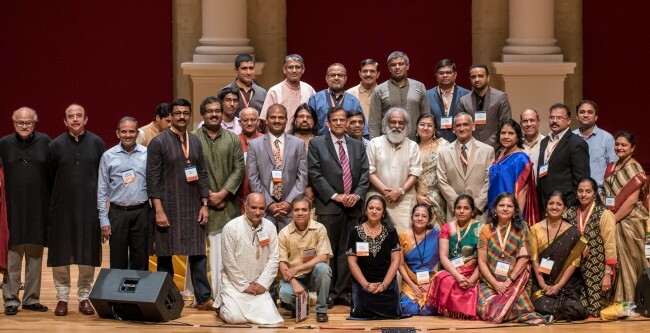 Sankaranethralaya Atlanta Team raised 300K at Dr. KJ Yesudas Carnatic Music Concert!!! Photos by Venkat Kuttua photography. “To sing is to pray twice” St. Augustine said. The true essence of these words is realized when a musical legend’s complex Carnatic compositions, rhythms and notes transcend boundaries to create magic. Time stood still as Padma Vibhushan awardee Dr. K.J. Yesudas’s mellifluous voice reverberated at Lassiter High School Concert Hall in Marietta GA on Sunday, September 17, 2017. Co-sponsored by CAMAGA, the sold out annual fundraiser with a purpose of providing free eye care in India for Sankara Nethralaya Ophthalmic Mission Trust raised 150K at the event. Dr. Ravi Sarma and Dr. Seshu Sarma donated $160,000 from his family foundation named in honor of his mother, Pudipeddi Ramalakshmi. In the spirit of Gandhi-King teachings of Peace and Ahimsa, the Gandhi Foundation USA honored the maestro with “Ambassador for Music and Peace Award” for his outstanding contribution to humanity to bring the change we want to see in the world through his music. Bala Indurti opened the program with his welcome note, followed by S. V. Acharya, President of OM Trust, USA, who spoke about the objectives of the organization. “OM Trust has been instrumental in supporting the charitable work of Sankara Nethralaya” he said. Kicking off with Navaragamalika varnam Valachi Vacchi, the Gandharva Gaayakan, at 77, was at his galactic best transporting an already spellbound audience on a mesmerizing musical journey embellishing an array of ragas with well-chiseled sancharas making every note resplendent. 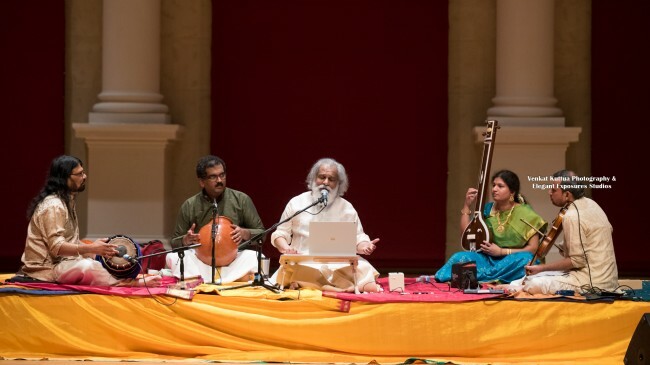 Effortless renditions of Vatapi Ganapati, Paavana guru, Enda medu kundu raagava, Ma bhavani Durga jadambe, Nagu momu gala nemi, Annaporne vishalakshi raksha, Kseerasagara Shayana, Swami Ayyappa, Alay paayute , Kundalalonelu , Karunachaiyva Krishna, Tiruppar kadalil, Rajiva netraya , Allah maalik kaun pukaare, Hari Varasanam only elevated the enticing experience. The tani avarthanam between Mridangist Nandakumar and Ghatham artiste Santosh Chandru was exhilarating. Engaging and indulging his audience in his divine aura, Yesudas was happy to yield to their song requests. Kannada song Krishna nee begene baaro, Hindi songs Jab deep jale aanaand Kishan dewaane delighted his diverse admirers. Yesudas was accompanied by Srikanth on the violin, T. S.Nandakumar on the Mridangam, Santosh Chandru on the Ghatam, and Varshney on the Thampura. “I’m tuccha vanar says hanuman – if he says that then what am I,” noted the celestial singer, accentuating his music with humor and humility. Before starting the well known Vathapi Ganapathim in Hamsadwani, invoking Lord Ganesha, Yesudas jokingly remarked that Vathapi is not the only song on Ganesha that he knows and that he will be happy to sing another composition on Lord Ganesha but gave in to the audience request and continued with Vatapi. Quoting an incident where he was spotted by some Hindi speaking folks on a train during one of his travels in India, Yesudas recalled singing Kishan Diwani, only to later be asked to sing a “Hindi” song “Gori Tera Gao”. “Is this not Hindi” he promptly asked, with a mischievous smile right after he sang Kishan Diwani, at the event, much to the amusement of his audience. 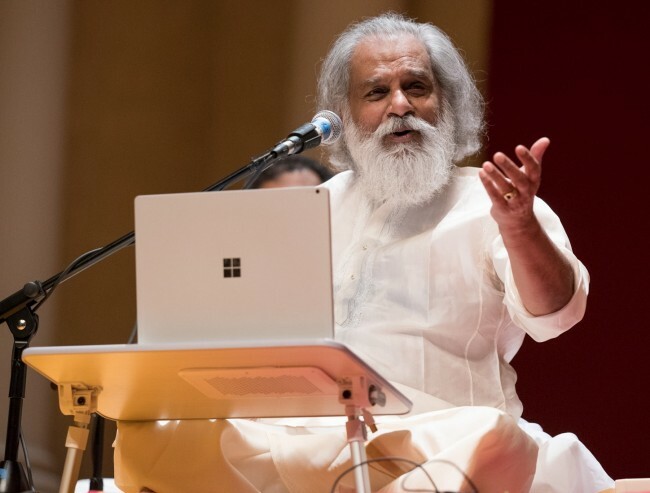 “Sri Yesudas is traveling in the “Sapthaswara Chari” – the universe of melody that the seven notes create and is taking the audience with him in that journey,” said Dr. Ram Sriram, President of the Carnatic Music Association in his concluding remarks. “This is scintillating music. 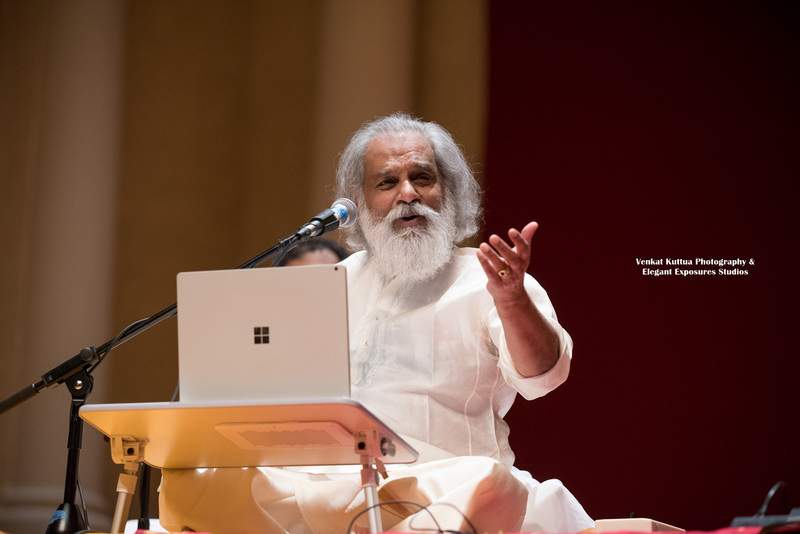 Each composition that Sri Yesudas sang during the concert inspired an emotional and spiritual feeling in the minds of the listeners. Its only when an artist feels the Bhavam or emotions in his own heart, he can, in turn, inspire such feelings in the hearts of the audience.” He added. The enticing, enigmatic musical experience concluded with the Peace Award presentation by Gandhi Foundation Atlanta trustees Subhash Razdan, Anthony Thaliath and team. Dr. Ravi Sarma spoke about his mother and the experience of her significant loss of eyesight despite having two doctors in the family adding that the incident inspired his donation. On behalf of Dr. Ravi Sarma’s family, Yesudas handed over the check the President of OM Trust. All artists were honored and volunteers recognized on stage. Dr. Seshu Sarma who was unable to be at the event was instrumental in bringing the event to life. “Dr. Seshu Sarma, with her dedication and leadership, brought together prominent community leaders and organizations and a group of dedicated volunteers to help make the event a great success. The community must indeed thank her for her laudable efforts.” The Om Trust stated. OM Trust-USA is the fundraising arm of Sankara Nethralaya that holds annual charitable events across the US to raise money for the eye hospital. Sankara Nethralaya, a charitable non-profit hospital started in 1978 by renowned Ophthalmologist Dr. Badrinath, offers high-quality eye care to everyone, regardless of their ability to pay. Doctors of Sankara Nethralaya have conducted numerous of eye-camps in villages around Tamil Nadu, Andhra Pradesh, Madhya Pradesh, and Maharashtra. Enormous poor patients receive preventive eye-care and those with impaired eyesight receive restoration of their eyesight. To defray costs of these treatments the poor are not charged any fees for the pre-operative or post-operative care. Sankara Nethralaya depends on donations from philanthropic individuals and organizations. Yesudas paid homage to Gandhi and King legacy at the invitation of the Gandhi foundation the following day, Sep 18th. He garlanded the Gandhi Statue, ‘Peace Walked’ through the Visitor Center Museum and Ebenezer Baptist Church, and laid wreaths at the King crypts. He saw the Gandhi Room in Freedom Hall, which was refurbished by the Indian American Cultural Association in 1987 with the help of Mrs. King, the Embassy of India, and financial support from the medical doctors, Sood, Radhakrishan Vanapalli, and Naidu, and other community members. The Walk ended at Dr. King’s birth home on Auburn Avenue. Rendition of Raghupati Raghav concluded the event on a high note. Sankara Netraylaya thanks core team Dr.Seshu Sarma, Moorthy Rekapalli, Bala Indurti, Krishnadas Pisharodi, Rajeev Menon , Uma Narayan, Srikripa Eashwaran, Antony Thaliath, Ashok Kumar, Raj Rengarajan, Viju Chiluveru, and Raghava Thadavarthi and all the volunteers who worked tirelessly for months to make this event successful. We will publish on our website www.deccanabroad.com it will goto Facebook and Twiiter instantly.